Are you feeling a touch of déjà vu when you look at this picture? Haven’t we seen this photo before? Is the Webmaster losing his marbles? No, it’s simply a game of spot the difference. If you have not read the earlier article on Website of the Year click here and see if you can see a difference between the two photos. If you don’t want to know the answer, look away now. Those who you who read the original article will know that there was an error on the original trophy concerning our website address. The ECF agreed to produce a corrected version and did not not want the first trophy returned so we are now the proud possessors of both an official Website of the Year trophy and an unofficial imperfect one. The club will keep one copy and the Webmaster the other but who should have which? 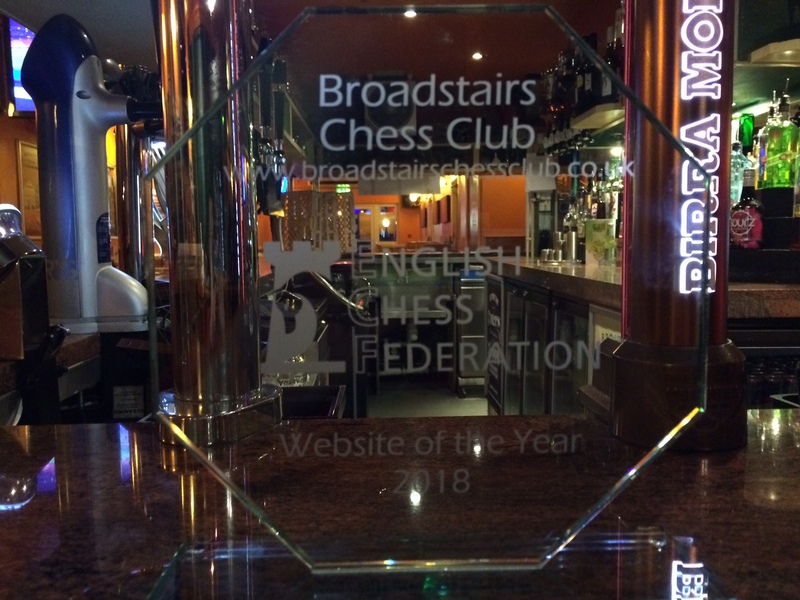 While all the excitement of the latest photo session was taking place, Andy Flood, supreme commander of the Thanet Chess Congress, casually announced that actually he, too, had received a similar trophy for Congress of the Year 2018 so watch this space for more shameless self-promotion in the near future. Meanwhile, what’s happening at the club, you might be wondering. Well, this season promises to be one of the closest club championships in living memory. David Faldon (175) has won or shared the Goodall Cup every year since he joined the club in 2010. However, he has some genuine competition this year with the arrival of Trefor Owens (167), Arnaud Wisman (155) and Shany Rezvany (163). Other new members have already made their mark: Paul Johnson (116) won his first four games in the Goodall including victory over Shany, and Richard Clement (128) beat Trefor in his first game. Perhaps this is David’s tactic: lie in wait and let the others make enough mistakes so he can coast home as usual. We shall see.